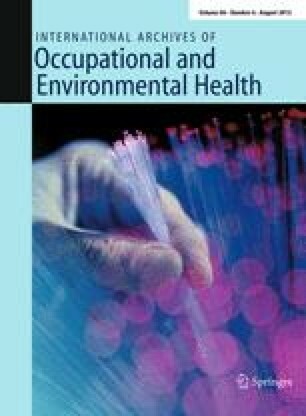 To address earlier reports of excess cancer mortality associated with employment at a large transformer manufacturing plant, each plant operation was rated for seven exposures: Pyranol (a mixture of poly chlorinated biphenyls and trichlorobenzene), trichloroethylene, benzene, mixed solvents, asbestos, synthetic resins, and machining fluids. Site-specific cancer deaths among active or retired employees were cases; controls were selected from deaths (primarily cardiovascular deaths) presumed to be unassociated with any of the study exposures. Using job records, we then computed person-years of exposure for each subject. All subjects were white males. The only unequivocal association was that of resin systems with lung cancer (odds ratio = 2.2 at 16.6 years of exposure, P = 0.001, in a multiple logistic regression including asbestos, age, year of death, and year of hire). Certain other odds ratios appeared larger, but no other association was so robust and remained as distinct after considering the multiplicity of comparisons. Study power was very limited for most associations, and several biases may have affected our results. Nevertheless, further investigation of synthetic resin systems of the type used in the study plant appears warranted. This research was conducted under contracts with the University of Lowell Research Foundation and General Electric Corporation.